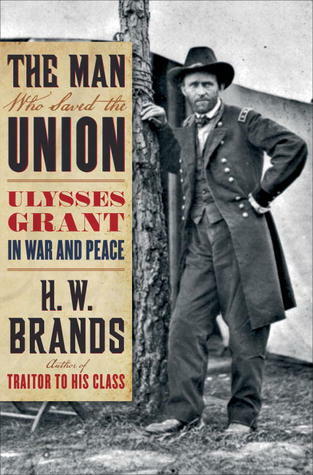 “The Man Who Saved the Union: Ulysses S. Grant in War and Peace” is H.W. Brands’s 2012 biography of the eighteenth president. Brands is a professor at the University of Texas and a prolific author. He has written nearly thirty books on a wide range of historical topics including biographies of Andrew Jackson, Theodore Roosevelt and Aaron Burr. He is currently working on “Reagan: A Life” which is due to be published in mid-2015. Brands’s biography is the sixth – and the newest – of the Grant biographies I’ve read. This is a solid, if not always exciting, analysis of Grant and it provides a well-balanced view of Grant’s life (though ultimately with an eye toward redemption of his legacy). During the book’s earliest chapters Brands allows Grant to do most of the talking. Much of this early text consists of Grant’s own words (from his letters and Memoirs in particular) with Brands’s thoughts filling in the gaps. Although initially interesting, I began to wish this tendency would become the exception rather than the rule – a wish eventually granted. One of the best aspects of this biography is that Brands consistently provides excellent historical context. Never does the reader feel locked in on just Grant but always remains aware of the bigger picture. Of all of Grant biographers, Brands seems to do this the best. Brands’s biography also provides some of the best coverage of Grant’s presidency I’ve seen. Relative to his military service, Grant’s two terms in the White House are comparatively dull and almost…tedious. But with America recovering from the Civil War and engaged in the arduous task of Reconstruction, this is an important period and Brands does it justice. Often dispatched quickly by biographers – yet arguably more interesting than his political service – is Grant’s post-presidency. This encompasses his 2½ year around-the-world trip and the drafting and publication of his Memoirs. Brands covers this period quite well. Readers acquainted with Brands as an author will probably find his writing style familiar. He is straightforward and rarely flashy; his words are deliberate and direct. But his narrative lacks the charm of McCullough, the captivating battlefield drama of Perret and the all-around appeal and insight of Jean Edward Smith. Military campaigns are well-described but lack something I’ve experienced from other biographies – the sense you are actually there rather than reading about it decades later. Grant’s participation in the Mexican and Civil wars is detailed but somewhat antiseptic. Incremental color provided by other biographers brought battles more vividly to life, but also better connected one moment to the next. Finally, there seems to be little scholastically or interpretively new in Brands’s biography. Grant’s life has been well-reviewed over the past two decades so it is not surprising that little new material is revealed. And while Brands treads no new ground, he is just the latest in a long string of biographers to “rejuvenate” Grant’s previously tarnished reputation. Overall, Brands’s biography of Grant is very good, but not quite great. It is a steady, methodical, deliberate and comprehensive biography that is rarely thrilling but seldom dull. Someone already acquainted with Grant’s life may find no reason to dive into this book. But for someone new to the life of Ulysses S. Grant, this is a solid (but not perfect) choice. Steve: I have not read Brands’ book on Grant yet, but I share your assessment of Brands’ ability to place his subjects in broader historical context. I felt he did this exceptionally well in his biography of Jackson, which has allowed me to recommend that book to my students. I have read much on Grant already — so this latest book has been sitting on my shelf — but your comments about getting the “bigger picture” may get me to pick it up sooner rather than later. I’m always looking to gain better perspective on the Reconstruction and Gilded Age eras and to be able to share that with students. Thanks for the review.